Michael Twyman, MD, MBA, specializes in preventive cardiology and helps men and women lower cardiac risk factors through lifestyle changes and optimizing nutrition, a key factor in health care that is often overlooked. He is board-certified in echocardiography and cardiovascular disease and practices at St. Louis Heart and Vascular with six office locations in St. Louis, St. Charles, and Bridgeton, Missouri, and Granite City, Illinois. Dr. Twyman was born in St. Louis and graduated from Rockhurst University in Kansas City in 1998. He received his medical degree and served his internal residency at the Saint Louis University School of Medicine. During his four years of active-duty service as a lieutenant commander in the U.S. Navy, Dr. Twyman was a staff physician at the naval hospitals in Charleston and Beaufort, South Carolina. 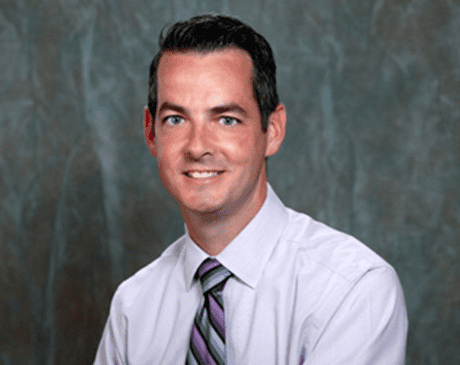 Dr. Twyman received his master’s degree in business administration from Webster University in Missouri before returning to St. Louis for medical training, achieving his cardiology fellowship at the Saint Louis University of School of Medicine in 2012. An invasive cardiologist, Dr. Twyman performs diagnostic cardiac catheterizations through the wrist using the innovative radial artery approach. This method has fewer complications and enhanced safety and comfort compared to the traditional method performed via the femoral artery in the groin. Dr. Twyman centers the care he provides on finding the root cause of disease with an array of effective techniques. He is highly skilled in the advanced modalities of echocardiography, including strain and 3D imaging, which is especially useful in assessing heart valve disorders. Strain imaging is a successful emerging technique to assess abnormalities of the heart and evaluate chest pain, particularly for men and women undergoing radiation therapy or chemotherapy for cancer. Dr. Twyman has extensive experience interpreting coronary calcium scoring tests and advanced lipid profiles. He utilizes an integrative and comprehensive approach to treatment and combines the latest state-of-the-art technology with scientifically proven alternative therapies.